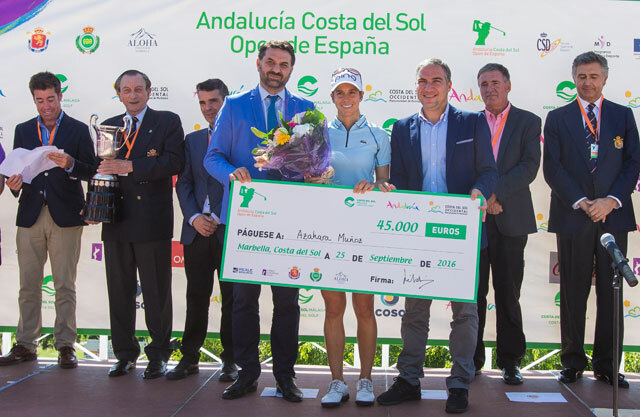 Home favourite Azahara Muñoz pipped Beth Allen at the final hole to become the first Spanish winner in the history of the Andalucía Costa del Sol Open de España Femenino, playing virtually in her own back garden. Muñoz fired rounds of 72, 66, 70 and 70 to end with a 72-hole total of 10-under-par and finish one stroke clear of Allen at the gorgeous Aloha Golf Club in Marbella, just a month after becoming the first Spanish woman to tee off in the Olympic Games in Rio de Janeiro. 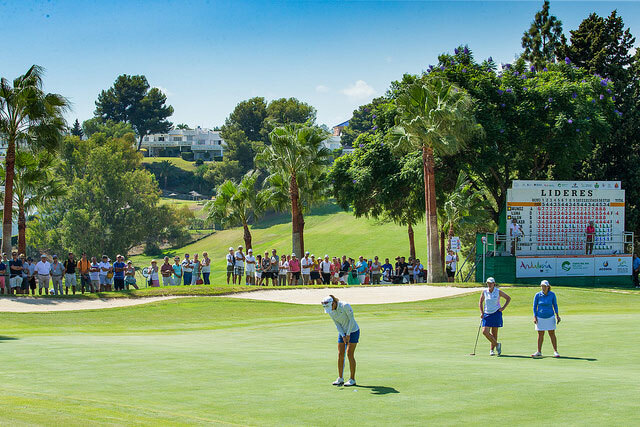 The 28-year-old, from the nearby town of San Pedro Alcántara, just 10 minutes away from the golf club, claimed her fourth Ladies European Tour title in front of a large gallery of spectators including her parents, friends and family. Muñoz started the final day one stroke behind Allen but the Scotland-based American had built a three stroke lead after as many birdies in seven holes. Allen made an error on the short eighth but quickly recovered with a birdie at the ninth to take a three stroke advantage though the turn. Although Muñoz birdied the third, her putter went cold as she made a run of 10 straight pars but her patience paid off after Allen carded back to back bogeys on the 12th and 13th holes. Muñoz made a crucial birdie putt on the 14th to tie for the lead but then bogeyed 15 to drop one behind again, before rolling in a monster birdie putt from eight metres on the par-3 17th to put Allen under pressure coming to the last hole. From the 18th tee, Allen pulled her shot left into the lake and was forced to take a drop, playing her third shot up to the green. Muñoz played her approach shot from the right hand rough up to around two metres from the pin. After Allen’s putt for par raced past the hole, Muñoz had the luxury of two putts for the victory, but it was a modest celebration. There was plenty of drama on the 18th hole as moments earlier, England’s Sophie Walker holed her second shot for eagle from 138 yards using a ‘little’ 7-iron to vault into a share of third position with compatriot Georgia Hall, followed by fellow Englishwoman Florentyna Parker in solo fifth place. Parker birdied two of the last three holes, with fellow LET player Ellie Givens caddying over the weekend. Aditi Ashok from India finished in solo sixth place on three-under-par to record her career best finish while fellow LET rookie Olivia Cowan of Germany ended a stroke back in seventh. England’s Holly Clyburn, Italian Diana Luna and Nanna Koerstz Madsen of Denmark shared eighth on level par.